What do you get when you marry two of Earth's most dramatic natural events, lightning and volcanoes? The answer is a "dirty storm," an infernal melange of lightning, magmatic fire and ash that surpasses even the wildest Hollywood disaster movie effects. If the volcano has enough energy, dozens of bolts -- which blast upwards, rather than downwards -- can spawn in the ash. At the Volcán Calbuco in Chile, photographer Francisco Negroni captured a stunning example of the phenomenon, winning second prize at this year's Epson Pano awards. If you think I'm exaggerating about how dramatic these storms can look, a quick Google image search of "dirty storm" will change your mind. All suggest that some kind of impending apocalypse/horsemen scenario is about to take place. Many of the best ones were taken by Negroni himself, but even he admits that the image above is special. 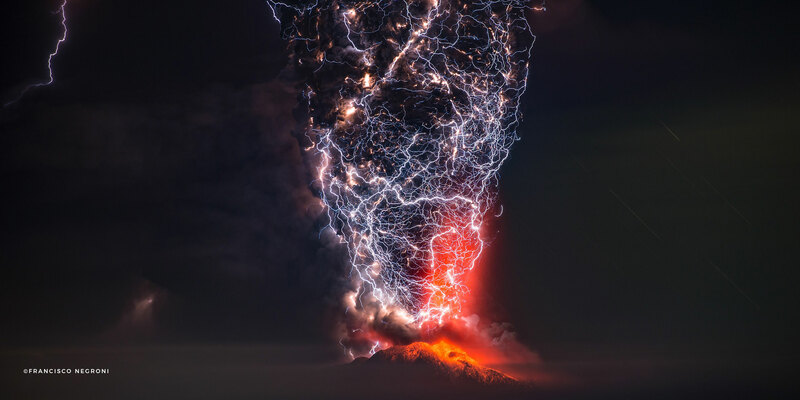 "The photograph with which I obtained second place in the Pano Awards was taken during the violent eruption of the Volcán Calbuco, located in the south of Chile," he told Engadget via email. "The technique was simple: long exposure, tripod and a 80-200mm lens. Approximately 10 minutes to achieve that incredible image that, without a doubt, is my best photograph of an eruption and I think the best taken in the world." How does this happen? In a regular thunderstorm cloud, lightning is created when rising air makes ice crystals and water droplets bump together, forming static electricity. Once the charges build up enough to surpass the atmosphere's natural insulating tendency, lightning discharges either from one cloud to another or to the ground. Volcanic lightning works on the same principle, but via different actions. Recently, researchers studying one of the world's most active volcanoes, Japan's Mount Sakurajima (above), learned more about how it forms. Using high-speed cameras, they discovered that charge created by churning magma builds around the rim, electrifying the ash just above it. That creates an electrostatic potential in the lower portion of the ash that eventually causes lightning to discharge into the cloud or air, often in the opposite direction of regular lightning. As such, lightning formation is usually limited to the bottom part of the ash plume, and depends strongly on how the plume develops. Chile is located on the Pacific "Rim of Fire," and has 90 active volcanoes, the second most in the world after Indonesia. Negroni has photographed volcanoes like Llaima in the Araucania region, the 2011 eruption of Puyehue-Cordon Caulle, and in 2015, the Villarrica Volcano and Calbuco pictured here. Volcanologists and seismologists have become extremely adept at detecting eruptions ahead of time, so endangered inhabitants were evacuated well ahead of time. Though volcano science has improved dramatically, getting near active ones that produce lightning isn't for the faint of heart. "Photographing volcanoes is very dangerous and I do not recommend it to anyone," Negroni said. "But if you have the opportunity to do it from a very safe place, it will be an incredible show that nature gives us."